Match thread is here. It's actually a dead rubber but still, we need to win both games to salvage some pride. This will be a day & night match and starts a little late than ususal. Conditions are likely to be overcast in Hamilton, but showers are unlikely to interrupt the game. The pitch is expected to play faster than the one in Dunedin did. If Pakistan plays first then they will win by 23 runs. If Pakistan plays second then they will win by 3 wickets. 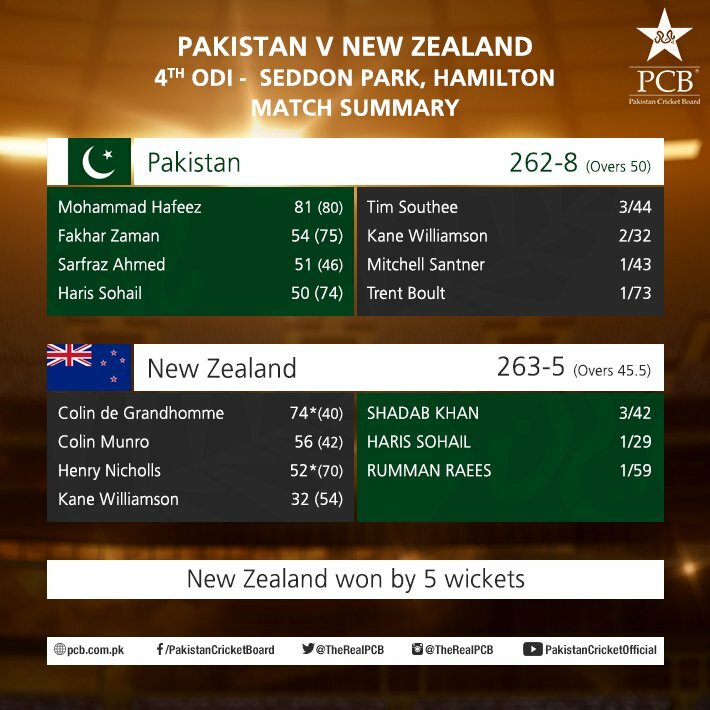 (01-15-2018, 10:03 PM) BBBD Wrote: If Pakistan plays first then they will win by 23 runs. They are four down now and Shadaab has taken three. Alaaaaaaaaaad!!!! good decision by Sarfaraz to bring Haris into bowling. Shadab needs support as he was able to take wickets and also block runs but he needs support from another end.